The Ducktator is a dungeon boss monster. Unbeknownst to many, a large amount of ponds are controlled by beings known as Ducktators. They are three times the size of the average duck, sporting a wingspan of up to 20 feet. They display hero-level intelligence, and have similar taste in killing and looting. However, they show much more skill in the later than heroes, often stockpiling millions of gold coins in their own ponds. They also often throw great parties at the expense of their duckizens. 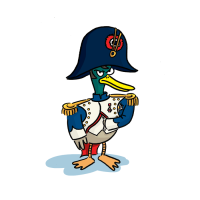 Some Ducktators in history stand out among others. The most recent being a ducktator by the name of Quack Jong-un, who rules over a small pond in a land distant from Godville. He has had many notable documentaries made of him and is most known for antagonizing the towns and cities around his pond, as well as for his propensity for odd hairdos. Can cause insanity through the endlessly repeated request "Got any grapes?